Mark Chatfield remembers when his Italian mother and grandmother would make pasta by hand mostly on special occasions, like Easter and Christmas. They would create a mountain out of flour, then form a hole in the center like a volcano. After pouring eggs in the middle, they would begin to combine the two, slowly, as the walls caved in. “You work it all in before it all runs all over the table,” he said. “Then take the dough and gather it in like you’re making a pie dough or biscuits. Then, you’ve got to know how long to knead it, when to let it rest. Eventually, you roll it out flat and either make lasagna noodles or cut it. The process is the “classic Italian way,” he explained. It’s a labor of love, one he only remembers on those special holidays. 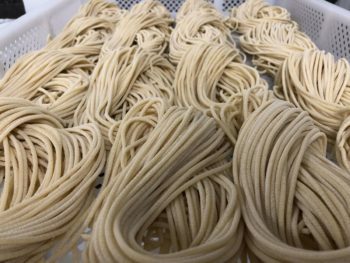 More recently, Mark brought the art of pasta-making to Charleston Bread. 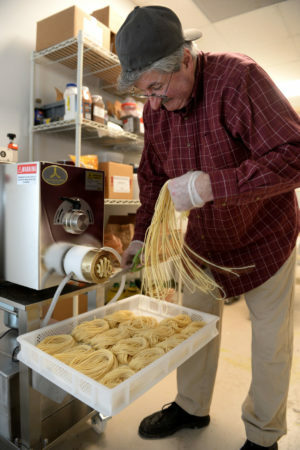 In mid-February, he and his wife, Libby Chatfield, began selling pasta out of their bakery located at 601 Capitol St. Soon, they’ll also begin providing it to Paterno’s at the Park, an Italian-American restaurant overlooking Appalachian Power Park. Mark teaches biology at West Virginia State University, but according to Libby, he’s also “the man who does everything” at Charleston Bread. Now, he’s the pasta-maker, too. However, making pasta at the bakery is different from the way Mark’s Italian family made it by hand, he admits. 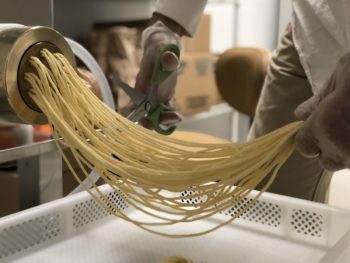 Instead of forming a volcano of flour, he uses a $35,000 state-of-the-art machine in a room he calls his “pasta lab” near the back of the bakery. In a single week, he makes several giant batches of fresh spaghetti, zucca, linguine, rigatoni, ravioli and campanelle. Mark says he can’t keep up with the demand. “Libby’s so good at selling,” Mark said. “That was the idea. She already has a customer base for her product. Here’s a new product — people will just buy it based on her reputation. 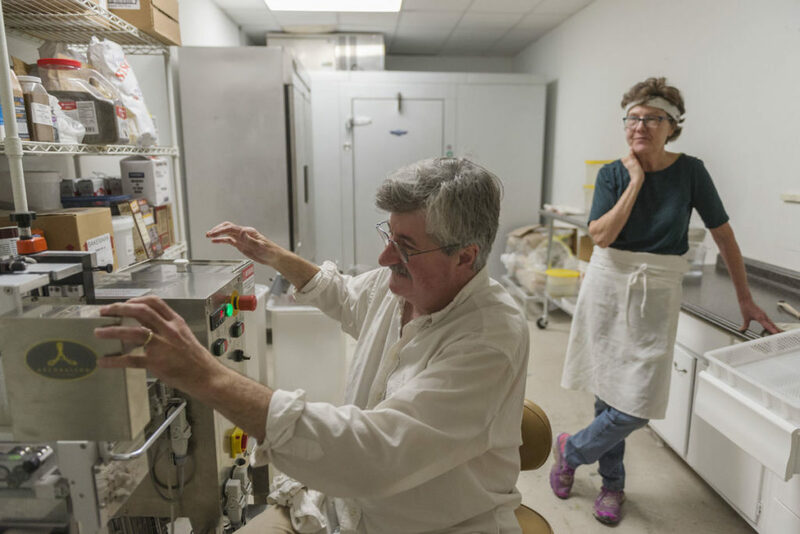 Instead of eggs, Mark combines water with flour into the machine’s mixer until he reaches the perfect blend. Then he flips a switch so the mixer will run in an opposite direction, which pushes the pasta out of a bronze die — a mold, of sorts, which shapes the dough, depending on the kind of pasta he’s making. The look is “rustic,” Libby noted. There are dozens of different dies which can be attached to make different sizes and shapes. 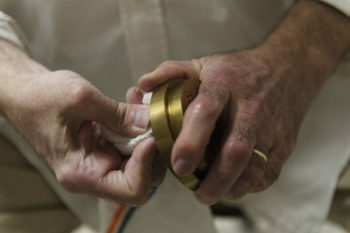 As the spaghetti exits the mold — about 40 strands at a time — Mark catches the ends, allowing it to stretch more than a foot before he cuts it with kitchen shears. He twists each bunch into a nest and makes about 48 nests per batch. 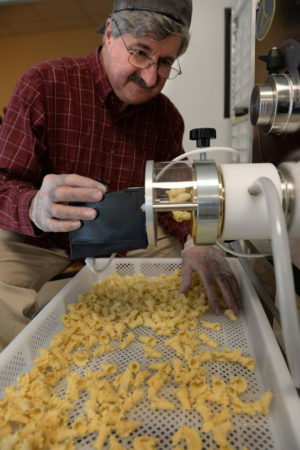 He learned the art from the creators of the Arcobaleno pasta machine itself, Antonio and Maja Adiletta, in Lancaster, Pennsylvania. In addition to mixing and shaping, the machine will cut sheets of pasta into different widths, like fettuccine for example. It will also fill and stamp sheets of pasta into ravioli, which Mark explained is very complicated. He remembers making ravioli with his family, when they would press the edges together with forks. He grew up in Maitland, a coal camp in McDowell County. Despite that, and the fact that his father was English, Mark remembers his community as mostly Italian. His grandfather, Nick Antonacci, came to America from Italy when he was 15 years old and began working as a stonemason in McDowell. Nick built a brick oven for baking bread next to route 52, where Mark’s mother grew up. The family would bake bread every week, and the oven quickly became part of the community. People would stop on the highway to ask for bread. 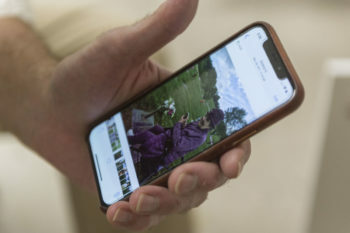 “That’s one thing I learned from my Italian relatives,” Mark said. “When you went to their house, the first thing they did was say, ‘Have you eaten?’ It didn’t matter. You sat down and ate something; you ate a meal or dessert. Nick also made bread and wine, built gardens, had a milk cow and raised hogs. He even made sausage. Like his family, he’s now sharing love the way Italians do — with food, especially good pasta.